Location: Cinnamon Lodge Big Sky Montana (http://www.cinnamonlodgeandevents.com/) The lodge is past the turn off to Big Sky Ski Resort on the left side of the road. Accomodations: Scouts are encouraged to sleep in tents around the building. There will be limited room to sleep inside the lodge if requested. This is a large building that we will slide the tables out of the way and put down sleeping bags. Scouts should bring a pad or cot. Sleeping bags can be put down when you arrive Thursday night and must be picked up and put away by 6:00 a.m. Friday and Saturday morning. This is one large open room. We will have to follow YPT. We can put up tents in the grass outside the lodge. Scouts should bring their own dinner on Thursday evening. Friday morning breakfast will be served. 6:30 a.m.
Friday we will make sack lunches to take to the mountain. Bring a water bottle and day backpack. Friday night dinner will be served. 7:00 p.m.
Saturday morning breakfast will be served 6:30 a.m.
Saturday make sack lunch and take to mountain. Bring a water bottle and day backpack. No Dinner Saturday night. Program is completed Saturday when the mountain is closed. Scouts can bring money and purchase food or drinks from the mountain. Allergies – If you have any food allergies please bring your own food. Travel: Troops are responsible for travel to and from the Cinnamon Lodge, to and from Big Sky Ski Resort mountain each day. Arrival: Between 5:00 p.m. and 9:00 p.m.
leave lodge at 7:15 am. 9:30 – 12:00 ski/snowboard lessons required to get second day of skiing. 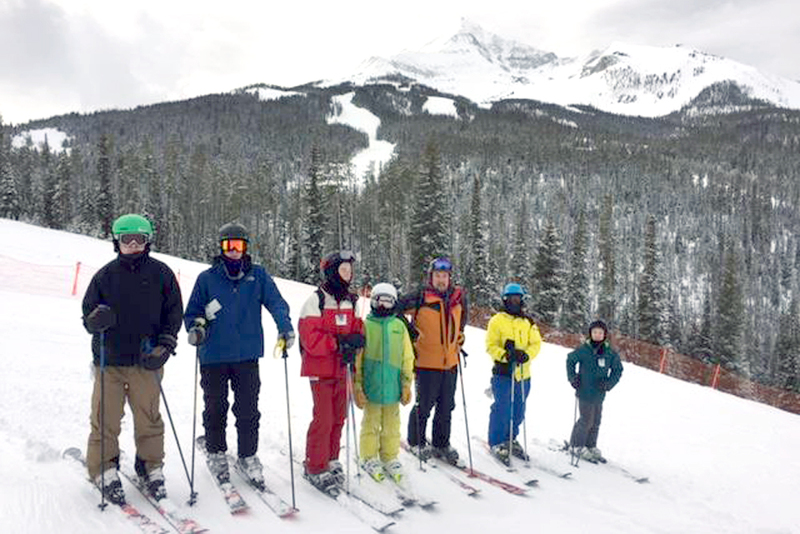 1-4 open skiing – more information at resort, need adult leaders support. Leave Lodge at 7:30 a.m. Troops will take all gear when they leave lodge. We will not return to lodge after we leave for mountain. This event is put on by volunteers so all scouts and leaders please plan on helping with this event. We need help getting food, cooking, dishes, garbage, mopping floors, cleaning tables, rental equipment, lift tickets, all the stuff to pull of this event. Then we need all the leaders to help on the mountain to ensure all the scouts have fun.